Set of 5 9.00 CTW Swarovski Stud Earrings Just $17.99! Down From $150! Ships FREE! 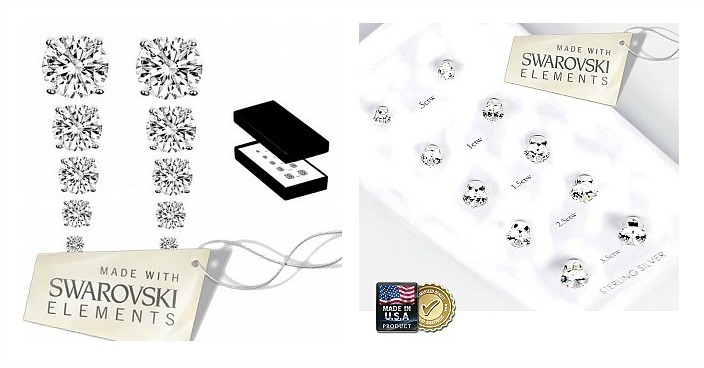 You are here: Home / Great Deals / Set of 5 9.00 CTW Swarovski Stud Earrings Just $17.99! Down From $150! Ships FREE! 13 Deals has this Set of 5 9.00 CTW Swarovski Stud Earrings on sale for $17.99 (Reg. $150)! Classic stud earrings sparkle and shine with round-cut Swarovski crystals in four-prong sterling-silver settings. 5 total pairs with a total carat weight of 9.00 ctw.